As Vera Aqua Vera Vita continues to grow to serve Christ and those in need of clean water, we want to spotlight you, your efforts and how Vera Aqua Vera Vita is making a difference both in the communities we serve, but also the spiritual journey this organization may have taken you. Watch for coverage of Vera Aqua Vera Vita events, stories on the people and town of Monte Castillo, Peru, our volunteers, updates on the clean water solutions, and how Vera Aqua Vera Vita has made a difference in providing True Water True Life. For story ideas or spotlights, contact Jacob Niemeier, Executive Director, Vera Aqua Vera Vita, jniemeier@veraaquaveravita.org or contact Sharon Dunten, communications specialist volunteer, at sdunten.veraquaveravita@gmail.com. 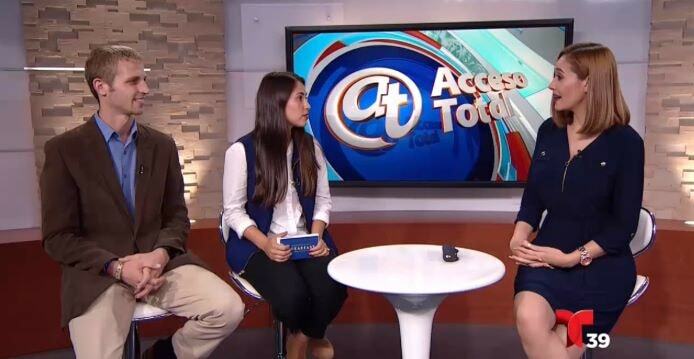 Founder, Jacob Niemeier, and volunteer, Fernanda Munoz visit with Adriana Lopez on Telemundo 39. 2019-03-22 | Dallas, Texas — Vera Aqua Vera Vita (VAVV) Founder & Executive Director Jacob Niemeier was interviewed by VoyageDallas Magazine where he had the opportunity to tell VAVV’s origin story and share about the exciting things VAVV has accomplished since it was founded in June 2017. From the Interview: “Jacob, let’s start with your story. We’d love to hear how you got started and how the journey has been so far. 2019-02-01 | Dallas,Texas — Vera Aqua Vera Vita (VAVV) Founder & Executive Director Jacob Niemeier returned to Guadalupe Radio Network KATH 910AM in Dallas, Texas, on Feb. 1, 2019 and was interviewed by local Catholic radio legend, Dave Palmer for the Third (Holy Trinity) Time. In the interview, Niemeier shared an update on what Vera Aqua Vera Vita is currently up to these days. In addition, he also spoke about the success of Phase I of their project in Monte Castillo with the commencement of operation of the Water Treatment Facility in the coming month. Niemeier went on to share about the campaigns VAVV has going on right now and their vision for 2019 and beyond! 2018-11-16 | Dallas,Texas — Vera Aqua Vera Vita (VAVV) Founder & Executive Director Jacob Niemeier returned to Guadalupe Radio Network KATH 910AM in Dallas, Texas, on Oct. 16th, 2018 and was interviewed by local Catholic radio legend, Dave Palmer. In the interview, Niemeier rehashed for new listeners the mission of Vera Aqua Vera Vita and how he was called to start this non-profit organization. In addition, he also spoke about the fruits of consecrating VAVV to the Immaculate Heart of Mary and the Sacred Heart of Jesus. Palmer asked about the results of the VAVV Inaugural Event, “A Evening At A Speakeasy” which was on Oct. 13, 2018. Niemeier shared with Dave the success of the event with 125 tickets sold and over $5000 raised for the 2nd phase of their work in Monte Castillo, Peru. Niemeier went on to share about the holiday campaigns VAVV has going on right now and their vision for 2019 and beyond! 2018-08-28 | Monte Castillo, Piura, Peru — Manuel was a strong, productive man in the village of Monte Castillo, Peru. That is until he drank contaminated water that placed him into a spiral of health issues that threatened his life and changed his family's security. Jacob Niemeier, executive director of Vera Aqua Vera Vita, a non-profit faith-based organization based out of Dallas, Texas, met Manuel in 2016 when he was working, “for lack of a better term,” at a utility agency that managed the small water and wastewater infrastructure in the village where Manuel lives. Monte Castillo is located in the extreme north and west part of the country of Peru. It is located near the town of Piura. “Manuel was strong, vibrant, and a healthy man full of energy,” said Niemeier. Since 2016, Manuel's health has deteriorated greatly because the water he drank from a local unknown water source containing larval eggs from parasitic worms. “He was medically diagnosed to have the worms but not before the parasitic worms debilitated him,” said Niemeier. A parasite is an organism that lives within or on a host and varies widely. The host is another organism or a human being, states Medical News Today website. “The parasite uses the host's resources to fuel its life cycle. It uses the host's resources to maintain itself. Most parasites are not visible to the human eye, but some worm parasites can reach more than 400 yards in length,” states MNT. Furthermore, parasites are not a disease, but they can spread diseases and have different effects. For Manuel, the larval eggs were found in his bloodstream and invaded his brain and hatched into parasitic worms that began to slowly and painfully paralyze him,” said Niemeier. Manuel is now in a wheelchair. “He subsequently lost a dangerously unhealthy amount of weight, motor skills and his speaking skills were greatly impaired, and his life was changed forever,” said Niemeier. But with modern medicine, “and by the grace of God” doctors were able to remove the worms but the damage had already been done,” he said. “Bear in mind, he got sick because honestly, more often than not, he and the people of Monte Castillo have no choice but to drink the water they can get and just hope and pray they don’t get sick,” said Niemeier. Although it is the 21st century there are more than 800 million individuals that lack reliable, clean water on this planet, reports the World Health Organization. “We are in Peru working in solidarity with and empowering the people in the development of a water treatment facility under construction right now,” said Niemeier. “The facility and its operations might begin to provide clean, safe water in early 2019,” he said. With the new water treatment plant, Vera Aqua Vera Vita's goal is to provide clean drinking and cooking water for the 7000 residents of Monte Castillo and change the lives of the people so they no longer have to fear getting sick from contaminated water. “It will begin to help them to go from simply surviving to ultimately thriving as God intended them to be,” said Niemeier. 2018-10-09 | Dallas, Texas — On Monday, October 8, 2018 our very own founder, Jacob Niemeier, and volunteer, Fernanda Munoz were interviewed in Spanish by Adriana Lopez on Telemundo 39. The interview aired on TV on Tuesday, October 9, 2018. 2018-09-21 | Dallas,Texas — Vera Aqua Vera Vita (VAVV) Founder & Executive Director Jacob Niemeier spoke with Guadalupe Radio Network KATH 910AM in Dallas, Texas, on Sept. 22, 2108 and was interviewed by local Catholic radio legend, Dave Palmer. 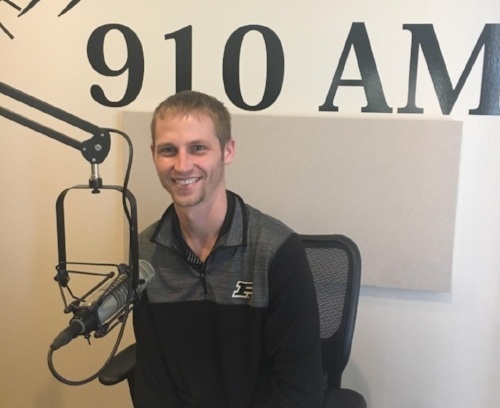 In the interview Niemeier spoke about the mission of Vera Aqua Vera Vita and how he was called to start this non-profit organization while still in college at Purdue University. In addition, he also shared how VAVV has broken ground for its first clean, safe water system facility in Monte Castillo, Peru, and thanked the many donors for their donations to VAVV to help build this facility. Niemeier also praised the support from the local Peruvian organizations who are helping this facility come to life. Palmer asked about the VAVV Inaugural Event, “A Night At A Speakeasy” on Oct. 13, 2018. Niemeier said it will be an annual event to celebrate VAVV and also a fundraising event where 100% of the proceeds will go for the construction of clean, safe water systems. The “Speakeasy” event is open to everyone.